Hi everyone!The Spring is come.Are you ready for bass fishing and fly fishing?Have you purchase fishing tackle including fishing rod,fishing line,fishing baits and fishing weight? If not,don’t worry about that.Come and go through our website www.fishpaby.com. You will find some surprises on fishing tackle. We are specialize in tungsten fishing sinker for many years.We are proud of the best quality of bass fishing sinker,ice fishing jig and fly fishing beads.Also they received high marks from our customers all around the world.If you have any inquiry or requirement,please feel free to return us on Facebook,ins or email. OK,before talk about today’s major.Maybe I should ask you some questions.Will you choose a bait?Do you choose the wrong one when picking the bait?Are you often wasting a lot of money and energy on picking the wrong bait? If these problems occur frequently before you go fishing, then today we will share today's major. That is:Do not waste when you choose lure baits.But how to avoid? I believe that everyone has turned a lot of mistakes in the process of choosing the bait. When I was out of bass fishing, I was often troubled by the inability to choose a suitable bait or weight. A lot of bait was bought back. After arriving at the fishing ground, it was found that it was not easy to use or even can’t be use, which was a waste of money and wasted energy. Today, I will simply talk to you about how to choose the right bait in daily fishing. In general, the choice of bait should be combined with the following main points of attention, as long as you master it, you can find a suitable Lure bait. First, look at the target fish type. first look at what type of fish you want to fish when you choose a suitable road bait. If you are fishing for large fish, then you should choose a slightly larger lure when you choose the bait. And add weights such as tungsten fish when needed.If it is a small fish, then choose a small road bait and according to the size of the fish. In addition, it is necessary to pay attention to whether the target fish is a shallow-water habitat or a deep-water habitat. Shallow-water fish can use a bait with a relatively small weight. Because the bait with a small specific gravity has a good floating effect, and the swimming posture is relatively exaggerated and full of temptation. 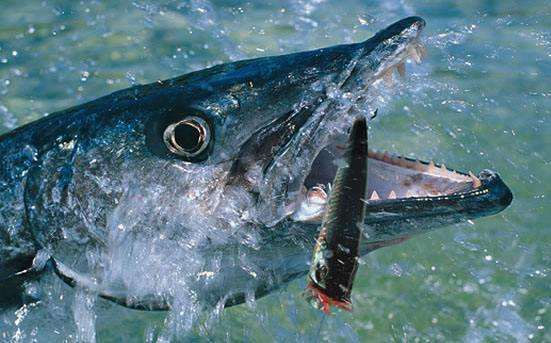 Deep-water fish use a relatively heavy bait, mainly focusing on dive to the target water layer for quick and easy operation. Second, look at the weather.There are fish in the water but the fish does not bite.A big reason is the weather. When the temperature is changes frequently, the fish will not bite. Therefore, when choosing, we must also consider the reasons for the weather.If the weather is fine and the environment is suitable. The bait should be choose with natural colors. The sequins should be relatively mild gold or dark.On the contrary, if the weather is bad, it is best to choose a bait with a large color difference.Red and white and even abrupt color. If the sequins are silver, you can choose silver.In addition, when the temperature is low, the activity of the fish will also be low. So the lure bait is best suited for slow operation. Third, look at the width of the water surface and the speed of the water flow. For fishing grounds with large water surface, you should choose a bait with a relatively large weight.For a small water surface should choose a bait with a relatively small weight. The size of the water surface affects whether you need a long shot to determine the weight of the bait. You should use of tungsten fishing lure not only throws a long distance from the search range, but also often brings a lot of unexpected gains.When fishing on wide water surface.The operation of small surface warfare is about fine-grained throwing. It is easy to cause excessive throwing or inaccurate throwing. For the water flow rate, if the water flow rate is too high, the minnow bait can be abandoned directly. Fourth, look at the underwater structure. The underwater structure is complicated to hide fish, but it also hangs bait. There are very few fish on the bottom of the structure. In fact, for complex underwater structures, it is recommended to choose a bait with a high weight and a small volume, which is convenient for operation. So the lure bait with high density tungsten fishing weight is the best choice.If the bottom structure is relatively simple, it is recommended to choose a bait with a relatively large volume and try to get close to the bait fish body type. This concludes the sharing of choosing the bait today.Again,if you have any inquiry or requirements about our article and products,please feel free to contact us.Have a nice day.